The winning bid on the Archive of Civil War paymaster Erastus Hibbard Phelps, Middlebury Class of 1861, was made at auction by Andy Wentink, Curator of Special Collections & Archives. The archive was one among nearly 350 lots of American History, including Civil War, materials offered by Cowan’s Auctions in Cincinnati, OH, last Friday morning, December 2. The Phelps Archive comprises 334 letters, 4 diaries (3 from Civil War years), 2 bound volumes including a photo album containing portraits of graduates of the Middlebury Class of 1861, many of which are inscribed to Phelps. 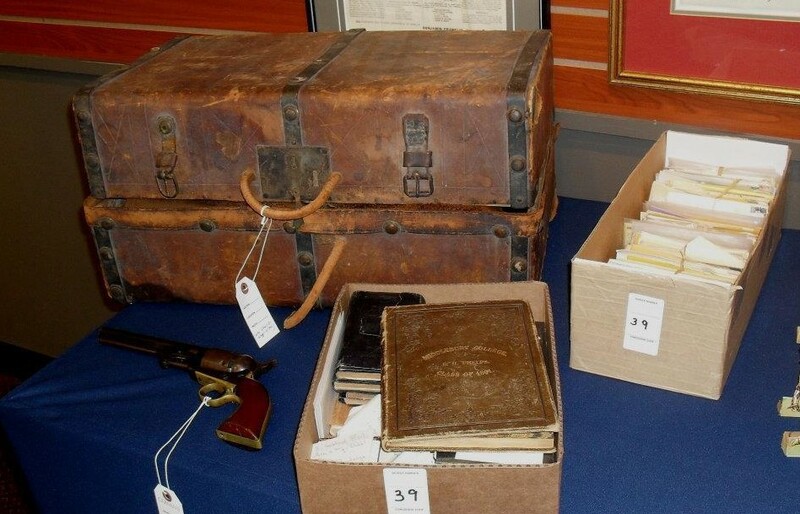 The archive also includes two photos of Phelps previous to his years at Middlebury, his paymaster sidearm (a Colt 1851 Navy 36 caliber pistol), what is believed to be his sheepskin winter jacket worn on duty, and a leather documents trunk carried during his service. This entry was posted in LIS Staff Interest, Middlebury Community Interest and tagged Civil War, College Archives, Facebook, Liaisons, Library Spotlight, lis website, manuscript collections, primary sources, research, Research & Collection Services, Research & Instruction, Special Collections on December 6, 2011 by Andrew Wentink.